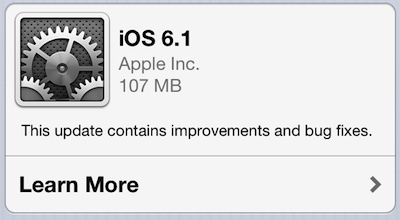 iOS 6.1 is now officially available for download. iOS 6.1 is a relatively minor update but there are still several new iOS 6.1 features, most notably wider LTE carrier support for the iPhone 5, 4th Gen iPad and iPad Mini as well as support for ordering Fandango movie tickets using Siri. “iOS 6.1 brings LTE support to more markets around the world, so even more users can enjoy ultrafast Safari browsing, FaceTime video calls, iCloud services, and iTunes and App Store downloads” said Philip Schiller, Apple’s Senior VP of Worldwide Marketing. Other minor improvements in iOS 6.1 include an update to the lock screen music controls, which add song, artist and album information and more subtle controls in keeping with changes to the Music app. In an effort to improve the troubled Apple Maps app, Apple have also made the ‘Report a Problem’ button within the app much more prominent. Reports emerged over the past several months that rapid diagonal swiping caused the iPhone 5 and 5th-generation iPod Touch to lose touch recognition, and these issues appear to have been resolved with a bug fix in iOS 6.1. Have you downloaded iOS 6.1 yet? Are there any issues that you think Apple have missed in this update? What would you like to see in iOS 6.2? Let us know in the comments.